[prMac.com] Waterloo, Ontario - SuperMegaUltraGroovy and Toastycode today announced the immediate availability of TapeDeck: an innovative audio recording application written exclusively for Mac OS X 10.5 Leopard. TapeDeck is a new audio recorder designed with a quick-capture workflow in mind. New recordings, called "tapes", can be started with a single mouse click (or keystroke). 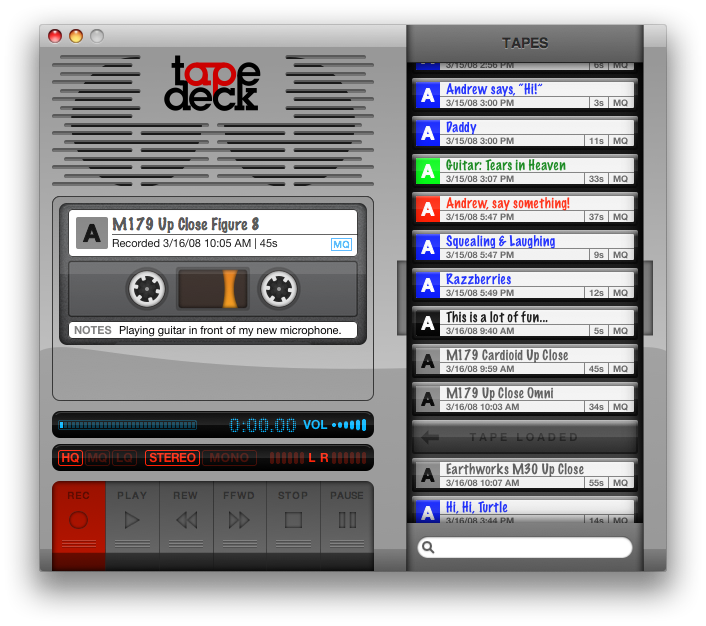 TapeDeck records directly to compressed MP4-AAC audio, making it useful for many applications including simple high-fidelity recordings of a band, practicing speeches, and capturing hours and hours of lecture. TapeDeck was designed to emulate a real cassette tape recorder with a few key differences. Every recording is automatically saved and organized in the searchable "tape box". There's no need to "tape over" anything, because a new recording is always just a click away. TapeDeck also adds many welcome improvements to traditional tape recorders, such as a never-ending supply of tapes to record on, far better audio quality, lots of space to write notes, and full compatibility with iTunes and the iPod. Rather than filling up a hard drive with raw AIFF or WAV audio, TapeDeck records directly to standard MP4-AAC files at one of three configurable compression settings. Users can add titles and even "liner notes" to each tape; TapeDeck allows fulltext searching on this data and makes it available to Spotlight, Quick Look, and iTunes as well. Tapes even look great in the Finder and Cover Flow. The rich animation features new to Mac OS X Leopard are put to dramatic use in TapeDeck's user interface, which is full of sound and motion. Live level meters, rotating cassette spindles, live search, and UI sound effects make TapeDeck truly fun to use. TapeDeck costs $25, and is available now. The unregistered version has approximately 2 weeks of gradually declining battery life, and only short, low-quality recordings are permitted. TapeDeck requires Mac OS X 10.5.2, and runs well on any Mac that runs Leopard. About SuperMegaUltraGroovy: Chris Liscio founded SuperMegaUltraGroovy in 1999, writing BeOS audio software during his undergraduate studies at the University of Waterloo. SuperMegaUltraGroovy is best known for FuzzMeasure, the 2006 Apple Design Award runner-up in the Scientific Computing Solution category. About Toastycode: Daniel Sandler started releasing software under the Toastycode label on the fourth of July, 2006 with the debut of Pyroth�que, his love letter to a misspent youth in a computer lab full of Mac Pluses, ImageWriters, and pixellated fireworks. Apple, Mac OS X, Leopard, Finder, Cover Flow, Quick Look, Spotlight, iTunes, and iPod are trademarks of Apple, Inc.